I am fascinated by my God. Whenever I am going through a particular struggle, He regularly brings scripture to mind to help me reconcile my thoughts against His Word. But then, I have to go to work. And if I’m not careful, I can lose my spiritual bearings in the busyness. I use my smartphone’s lock screen as a reminder. 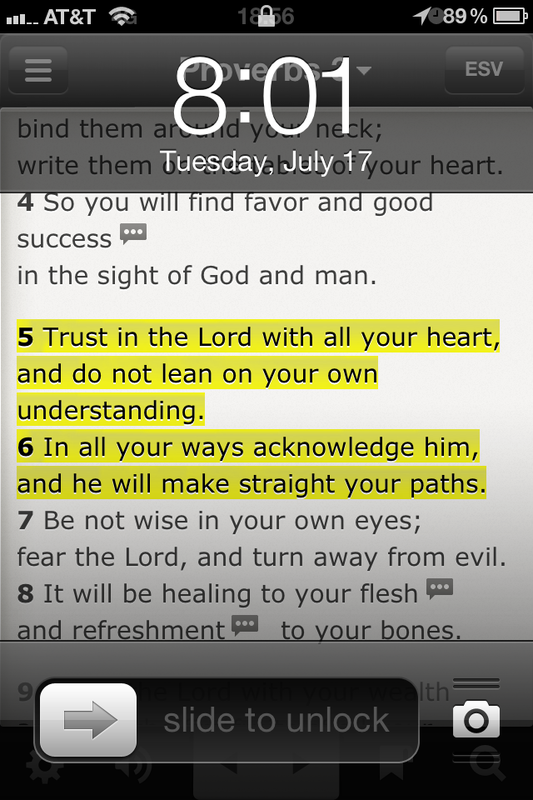 When there is a verse that I need to recall throughout my day, I look it up on YouVersion, my iPhone Bible of choice. Then, I take a screen shot (pressing the Home and Sleep buttons simultaneously on the iPhone) and save the picture as my home and lock screens. Anytime I look at my phone, I am reminded of the word from the Word I placed there. If you don’t carry a smartphone, there are still options. Why not write verses on index cards and keep them folded up in your pocket or wallet? Put a Post-It note up at your desk. Find a desktop wallpaper for your work computer (if you’re allowed to do so). The Word is so encouraging. Take advantage of it.